Using Gmail as a personal organizer is something that many users do. It has so many nice features, such as storing email as conversations, that are helpful in keeping users organized. Something that was missing, however, is the abilitity to add lists of tasks. To do lists are a very useful feature in any organizer. Some people have even tried to replicate this in Gmail by sending email to themselves. 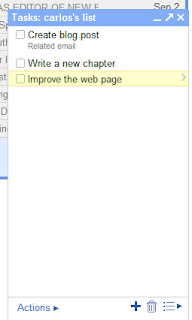 It turns out that now Gmail has its own to-do list. It is activated using the Google labs feature, where you can select it as an option. A link to the task list will appear bellow the contacts link. Just click it, and you will see a window similar to the Google Talk window.